Arc flashes are a dangerous on-the-job hazard in data centers. An arc flash occurs when electricity jumps, or arcs, between conductors. This can trigger an explosion that can kill or severely injure electricians and other workers, and cause major damage to a facility. 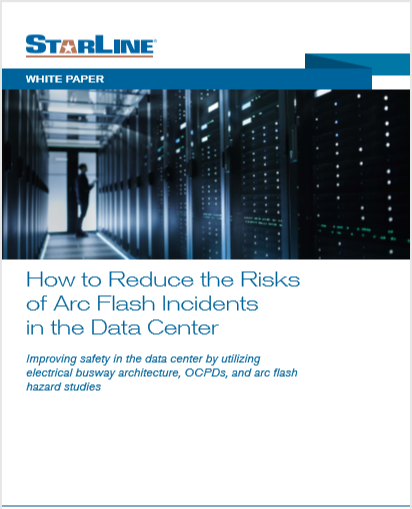 However, data center owners can mitigate and significantly reduce the potential for arc flashes through a variety of methods. These include (1) better, safer design and engineering of power distribution architectures (2) use of Overcurrent Protection Devices (OCPDs) to stop fault currents (3) performing an arc flash hazard study in your facility, and (4) knowing the right Personal Protective Equipment (PPE) that workers must use when working on electrical equipment where an arc flash is possible.